There are some fantastic people doing some great things in the testing communities. They’re starting new initiatives using their drive and determination, with the purpose of improving the software testing space. We love these people, and more importantly, we love to support these people. We’ve recently shown this by supporting Maaret Pyhäjärvi with Testing Gems. Now we are really pleased to announce that we’ve found another fantastic initiative to support, and that’s the Software Testing Clinic. The clinic was started, and is still ran by Dan Ashby and Mark Winteringham. Their goal and mission with the clinic is to create a safe environment where people who are new to testing can come along and learn new skills, ask questions and get mentoring from excellent experienced testers. Most importantly of all though, for free. You can find out about and register to attend their next clinic session on September 20th 2016 in London. We can get on board with all these things, and we feel it fits perfectly with our motto of ‘co-creating smarter testers’. We believe the Software Testing Clinic and Ministry of Testing are a perfect match. After talking to Dan and Mark it became clear we shared the same goals and visions for new testers, and importantly the skills needed. The Ministry of Testing is a fantastic community with a wealth of resources, paired with the passion of Mark and Dan, plus the awesome work was already done, we believe we can produce something that will change software testing training forever. In addition to this, we will be looking at how we can utilise the Dojo in a blended learning approach with the face to face clinics, but also to take the work of Dan and Mark to a wider audience. With the goal of having several clinics around the UK. While also bringing this curriculum to a wider, global audience. So that’s our opinion, but what do Dan and Mark think? "The Software Testing Clinic has come a huge way since we formed the idea and ran our first session back in May. We’ve run 10 sessions so with much more to come, and have put together an awesome curriculum that our students have really benefited from (of course with the help of some great mentors too). The success stories make it all worth it – we’ve helped bring new people into the testing world, helped people grasp new knowledge and experience about important aspects of testing, helped people to gain mentoring skills and experience and we have even helped some people get their first testing jobs too! We’ve always had big dreams and goals for growing the clinic too – taking it to different cities and expanding to reach more people. And that’s why we’re so excited to be partnering up with the Ministry of Testing. The Ministry of Testing is the biggest learning hub for testers. It drives so much within the testing community – with the organisation of all the different TestBash conferences, the fantastic webinars and all the online material and courses in the Dojo and the amazing wealth of information and resources on their website. It’s fantastic. This partnership is offering the Software Testing Clinic the chance to grow into something much bigger, with the opportunity to utilise the MoT’s well-established teaching avenues, as well as the opportunity to expand in much more locations all over the UK through the MoT’s contacts and connections. This partnership will also open so much opportunities for our students too, with being able to tap into the MoT’s wealth of resources. These are exciting times! Here’s to working together to help co-create smarter testers!" 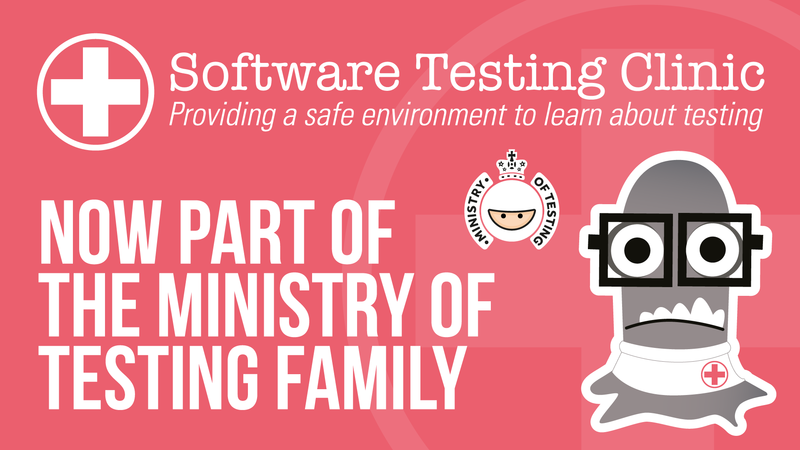 We’re very pleased and excited to welcome Software Testing Clinic into the Ministry of Testing family. Richard, Rosie, Dan and Mark.